Wash the green gram thoroughly and soak it in water for 40 minutes. Break red chilies into small pieces. Take a paper plate and add cumin and red chili pieces to it. Place this paper plate in microwave oven and roast on high power for 10 to 15 seconds. Take a mixie jar and add the roasted cumin and red chilies into it. Grind the red chilies and cumin to a coarse powder. Add soaked dal little by little and grind it. The texture should be slightly coarse but not a fine paste. 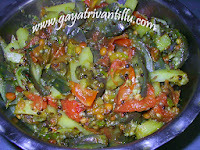 Take the ground chutney into a bowl and grind the remaining dal also to the similar texture. Mix the chutney well. Add asafoetida and salt to the chutney. Add lemon juice and mix again. Now the chutney is ready to serve. 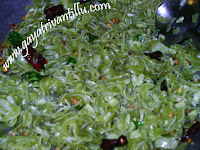 Transfer the chutney to a serving bowl and serve with plain rice and ghee. The asafoetida in this chutney along with the cumin gives a unique flavor. Though we used minimum ingredients yet the taste of this chutney is finger-licking. When there are no vegetables this dish comes out handy with great taste. When you need to handle extra guests at short notice also it is an excellent complimentary dish. You can add grated raw mango instead of lemon juice and get a seasonal flavor. If you don't have lemon on hand, you may add a bit of citric acid crystals, but you need to wait for a while before it gets mixed with the chutney completely. During my Grand Mother's time, lemons were not available all through the seasons. Most of the time ithis chutney was without being spicied with lemon, mango etc. Yet it used to taste great. 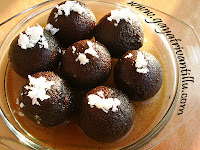 Don't be tempted to spice with tamarind. The looks and taste maynot be attractive! !